Bloomberg Sports Anchors Julie Alexandria and Rob Shaw discuss whether the fans’ selections for the National League All-Star team were right and who should be starting the All-Star Game in Kansas City on July 10. Buster Posey was not the right choice for the All-Star team. Phillies backstop Carlos Ruiz is having a sensational season, hitting .357 with 13 home runs, 46 RBI and a surprising three stolen bases. He has definitely been the best catcher in baseball this season. The fans got this one right by selecting Reds first baseman Joey Votto, who is probably the MVP of the first half of the season. He’s batting .350 with 14 home runs and 47 RBI. Brandon Phillips of the Reds should be starting rather than Dan Uggla. Phillips has a .279 average, 10 home runs and 47 RBI. He is also a good defensive player, which Uggla is not. The fans made the wrong choice by selecting Pablo Sandoval, who has missed plenty of time this season due to injury. David Wright of the Mets should have been the pick, as he has been an MVP candidate so far this year with a .350 average, 10 home runs, 55 RBI and eight stolen bases. Cubs shortstop Starlin Castro should be starting in place of Rafael Furcal. Castro is batting .291 with six home runs, 40 RBI and 16 stolen bases. Despite those numbers, he can be frustrating because he makes a lot of boneheaded plays but he is young and will hopefully grow out of that. Not one of the three outfielders chosen by the fans was the right pick. Carlos Gonzalez of the Rockies should be starting instead of Melky Cabrera. Gonzalez is batting .340 with 17 home runs, 58 RBI and 10 stolen bases, though he is helped out by playing at Coors Field. Brewers left fielder Ryan Braun should have been selected over Matt Kemp. Braun is once again putting up MVP numbers with a .309 average, 23 home runs, 59 RBI and 13 stolen bases. Finally, Pirates centerfielder Andrew McCutchen should have been chosen rather than Carlos Beltran. McCutchen is batting .360 with 16 home runs, 54 RBI and 14 stolen bases. Beltran would have been a good selection if the National League had a designated hitter. He has a .304 average, 20 home runs, 63 RBI and eight stolen bases this season. Carlos Ruiz: Breakout Player, or Regression on the Way? Joe Mauer…Brian McCann…Carlos Ruiz? Going into the 2010 season, not many people had Carlos Ruiz pegged as a .345 hitter with a .948 OPS. Yet here we sit in mid-May and Ruiz is exactly that. Welcome to the beauty of early-season sample sizes. However, the hot start raises the question…is there anything to suggest that Ruiz’s hot start is anything more than just that? In terms of being a .345 hitter, no. Ruiz is a career .253 hitter. Expecting him to maintain an average nearly 100 points higher is just silly. The inflated early-season average is a result of a ridiculously high batting average on balls in play (BABIP). We talk about BABIP around here a lot, with good reason. Throughout his career with the Phillies, Ruiz has a .271 BABIP. The average player is around .300, On the other hand, it is not uncommon to see catchers, who tend to be slow, with lower than normal BABIPs. 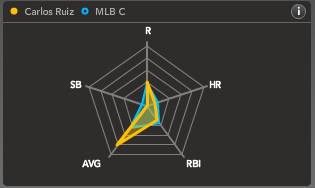 Ruiz’s BABIP thus far in 2010 is a robust, and unsustainable, .403. It is true that a hitter has slightly more control over his BABIP than a pitcher, but not this much control. Part of the reason for the high BABIP is an increase in line drives, a factor that a hitter can, in fact, control to some extent. Of the most common ways to put a ball in play – line drives, groundballs and flyballs – liners are the ones that go for hits more often than any other. Ruiz has a relatively normal career line drive rate (LD%) of 18.4%; that’s increased to 24.6% so far in 2010. An LD% more than 20% is sustainable, but only four players in the major leagues had a rate of greater than 24% last season. One would suspect Ruiz’s LD% to settle toward career norms; this would likely create a batting average chain reaction. His BABIP would likely fall, and in turn, so would his batting average. ZiPs updated in season projections have Ruiz with a projected .285 batting average at season’s end. That would mean a batting average of .267 the rest of the way. Even then, a .285 average is more than 30 points higher than his career number, but a lot more believable than the .345 average he boasts right now. Outside of batting average, the biggest change for Ruiz has come in terms of strikeouts and walks. Since joining the Phillies in 2006, Ruiz has posted favorable rates in terms of walks and strikeouts. His career walk rate (BB%) of 11.6% is decent, and his 12.8% strikeout rate (K%) is more than acceptable. 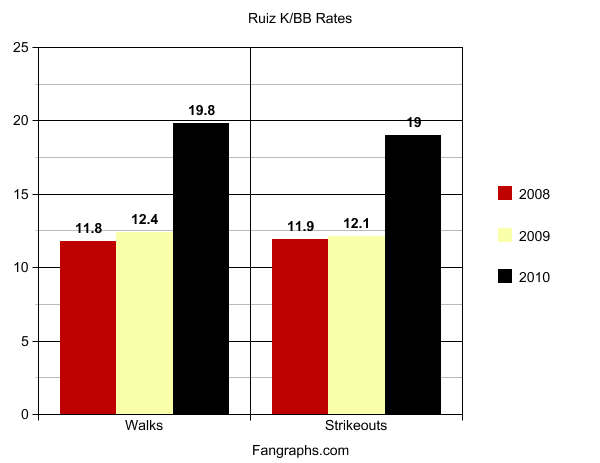 In recent seasons, Ruiz has posted nearly identical K and BB percentages. 2010 has been no different. What is different is an increase in both numbers. The 31-year-old has increased his BB% to 19.8%, but his strikeouts have also increased to nearly the same level (19.0%). Ruiz is swinging at pitches out of the zone 20.4% of the time, but that is not far off his career number of 17.4%. Pitchers are throwing slightly more fastballs to him, however, nothing that could be considered drastic. More likely, Ruiz has just improved his batting eye in terms of walks, and become more willing to work deep counts, even if it means more strikeouts. Power-wise, Ruiz has shown decent, not great, pop in his five-year career. His ISO or Isolated Power (slugging percentage minus batting average) of .131 in 2010 is very close to his career number of .133. His home run-to-flyball rate of 9.5 is slightly higher than his career number, although easily sustainable. If you were able to snag Ruiz as your catcher in the later rounds of your draft, enjoy the early-season success. While the batting average is expected to regress, the increase in walks could give him a very favorable on-base percentage, especially from the catcher position; that could boost his runs scored totals in standard 5×5 leagues. In terms of power, expecting Ruiz to duplicate his nine home runs and 26 doubles from last season is reasonable. If you’re OK with that production from your catcher, then Ruiz is your man. However, if you have a decent back-up option, you might want to strongly consider selling high on Ruiz and his batting average before the potential BABIP regression sets in. Assuming you can get inflated value for him, of course. *Carlos Ruiz was diagnosed with a right knee sprain on Wednesday. The injury should not require a DL stint. For more on Carlos Ruiz and other players with surprising starts, check out Bloomberg Sports’ Fantasy Kits.